Picked up this bottle back in January while on a pilgrimage to NYC’s Astor Wines. I haven’t seen it many places and there isn’t too much written about it out there, so it seems like as good a way as any to reignite my summer tasting schedule. Judging from the Frank-Lin Distillers site, this upper-midrange bourbon is made for “ranchers and cowboys” — more the self-styled variety than the actual no doubt. I don’t plan on rustling any cattle later, but I have seen The Good, The Bad, and The Ugly before, so here’s hoping that’s good enough. Affected, yes; unattractive, no. 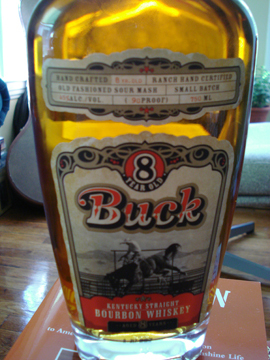 The main feature of Buck’s bottling is a rodeo-rider on a bucking horse underneath the name of the whiskey and its age (a rodeo-appropriate 8 years). There’s some tan/black filagree along the top of the label and framing the prominently placed basic info: “Old Fashioned Sour Mash”; “Small Batch”; proof/percentage/volume; “Ranch Hand Certified.” Useful, but that last one makes me feel a little silly buying this at all. The shape of the bottle is satisfying — feels heftier than most 750ml bottles and has a nice tall stance to it. I also like the design of the cork wrapping. It’s a nice detail to the over all appearance. There’s dried grass and pineapple at first on the nose, followed by more sweet scents (strawberryish) and but with the dry grass remaining strong with almost some maple-like hints. Liking this so far. That sweetness almost completely disappears on the tongue. The dry grass bursts forward and is followed by a lingering bitter pepperiness. Though there are some sweet notes later on they are drowned out by the assertive spiciness that dominates throughout. This is is an aggressive bourbon. If it weren’t already obvious, the finish is long and strong. Well, I guess ranch hands and cowboys are no wimps and Buck isn’t either. Even as a non-smoker, this makes me want to drink it with a nice cigar. I’d recommend having it on ice and only giving it to bourbon newbies if your want to scare them off from your collection. Despite all this, it’s good and well worth the money if you’re a fan of bold and spicy bourbons.